Categories: environment, ecology and green politics, globalization and world order, health. Robert M. Gould and Patrice Sutton, eds. 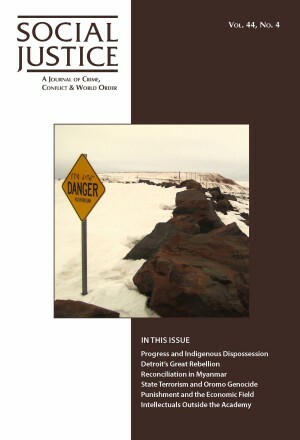 This issue explores threats to the survival of the world community due to the assault on all forms of life from an interplay of toxic chemicals, ozone depletion, climate change, and habitat destruction. After the September 11 attacks on the United States, the global outlook for harnessing the necessary resources and political will to combat such threats to public and environmental health has gone from bad to worse. Contributors here expose the dangers of the right-wing equation of collective security with militarism; the political and humanitarian problems of economic sanctions, which eschew the direct use of deadly force, but cause a disproportionate and deadly impact on the most unfortunate and powerless within targeted societies; violations of international human rights and humanitarian law in the Israeli-Palestinian conflict; the daily violence of a “normally” functioning world economic order, which undermines the fundamental human right of every working person to return home at the end of the workday alive and healthy; the role of states and their institutions in subordinating worker and community health to the needs of global corporations in the chemical disaster in Bhopal, India; the community health and environmental justice issues related to modern corporate food operations and the threat they pose to biosecurity; and the need to view global security in terms of “human security” (protection from the threat of disease, hunger, unemployment, crime, social conflict, political repression, and environmental hazards) and “international security” (the prevention of war and the right of all nations to live in peace).